G & G Duct Cleaning performs complete grease exhaust system cleaning as well as grease trap cleaning for restaurants across Manhattan, NY and the surrounding boroughs. Grease exhaust system cleaning is imperative not to neglect and without frequent cleanings or even improper cleanings, fires can result. For over 50 years, restaurant owners have trusted the experts of G & G Duct Cleaning for all of their grease exhaust system cleaning needs. We clean the entire system and when needed, we’ll install exhaust doors on the duct work to provide adequate cleaning. 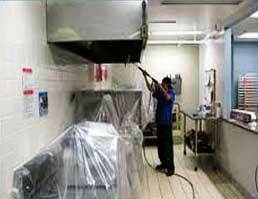 We can also remove all fire violations from the grease exhaust system as per New York City fire code. For grease traps, we’ll remove the cover and pump out the grease from the entire trap and replace the cover.